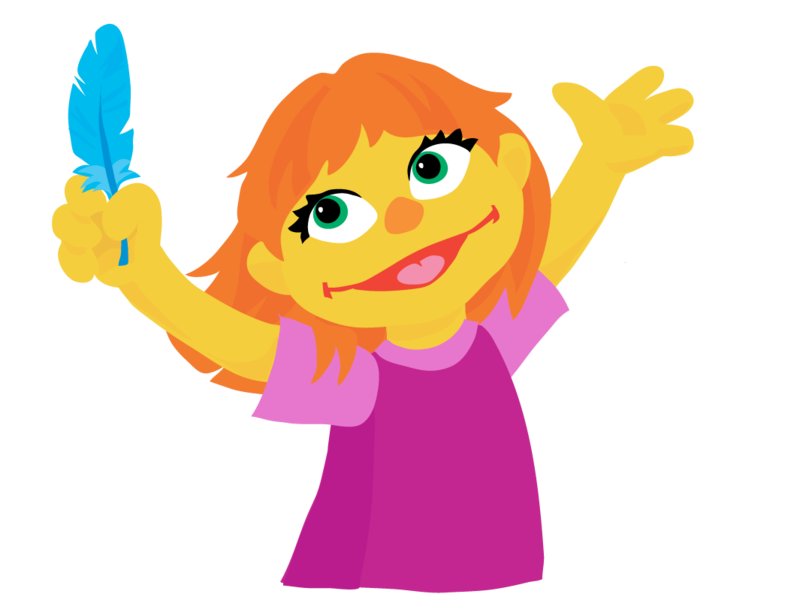 'Sesame Street' Introduces A New Muppet Character With Autism : The Two-Way Little Julia stars in the digital storybook called "We're Amazing, 1,2,3." Julia is described by the Sesame Workshop as "a preschool girl with autism who does things a little differently when playing with her friends." The muppet Julia has not yet made her TV debut, but the wide-eyed little girl with a big smile is the star of her own "digital storybook" called "We're Amazing, 1,2,3." For over a year now, Sesame Street has been working with organizations such as Autism Speaks and Autism Self Advocacy to help reduce the stigma associated with autism spectrum disorder. As part of the campaign "See Amazing in All Children," the adorable muppet Abby Cadabby explains in one YouTube video, "Lots of kids have autism and that just means their brains work a little differently." Julia is not the first fictional media character with autism. But Michael Robb, Director of Research for Common Sense Media, an organization that rates and reviews media aimed at children, says Sesame Street's move is "pretty groundbreaking." "It can be difficult to start a conversation about children with disabilities. It's even harder when that difference isn't visible," he says. After looking through "We're Amazing, 1,2,3," Robb says the story could help children be more understanding of how Julia is different. "It's very real in terms of talking in simple language. It spells out these things in concrete ways that kids can understand. It shows ways she's just like other kids. It shows how making simple accommodations can help Julia." According to Dr. Jeanette Betancourt, Senior Vice President of U.S. Social Impact at Sesame Workshop, says Sesame Street producers are waiting to hear back from the autism community before introducing Julia to the show on TV.